During the production of banner or other large format products, sometimes grommets must be added. To add marks, where these grommets shall be placed after the product is printed, this Switchboard action can be used. To define the positioning of the grommets, the margin for all 4 edges can be defined. Of course the number of grommets for the horizontal and vertical edges must be defined. The internal calculation will determine the distance between the grommets. Marks for the grommets will be positioned accordingly to the defined settings. An additional way to add grommets to the document is by defining the distance between the grommets vertically and horizontally. It is possible to add own types of grommets. 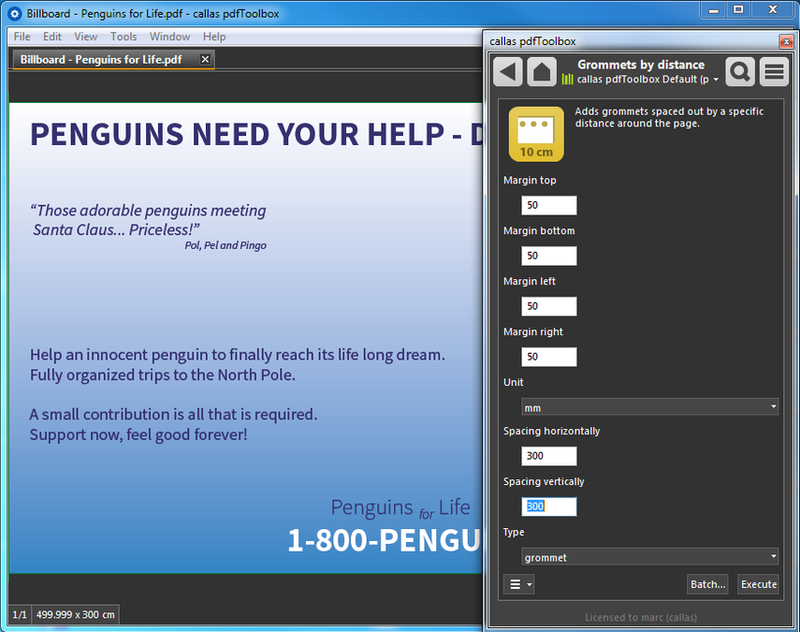 Just click on the menu button in the lower left and select "Manage type of grommets"
An Explorer/Finder window will open. 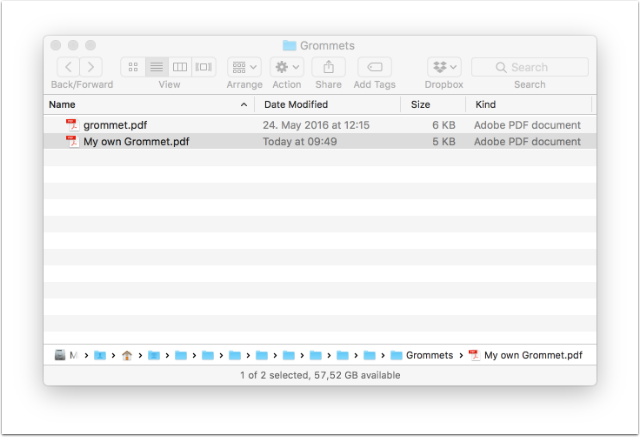 Just copy your own grommet as an PDF into this folder. Please mention, that the PDF must have the exact size of the grommet, as it will be positioned 1:1 onto the PDF. Each Library has its own set of grommets. If you want to have your grommets in all your Libraries - just repeat the steps and copy your own grommets into all your Libraries. When you have copied the own grommets PDF into the folder, go back to the Switchboard, click the "back" arrow in the upper left corner and select one of the grommet Actions again. The new grommet will show up in the "Type" pop up menu. 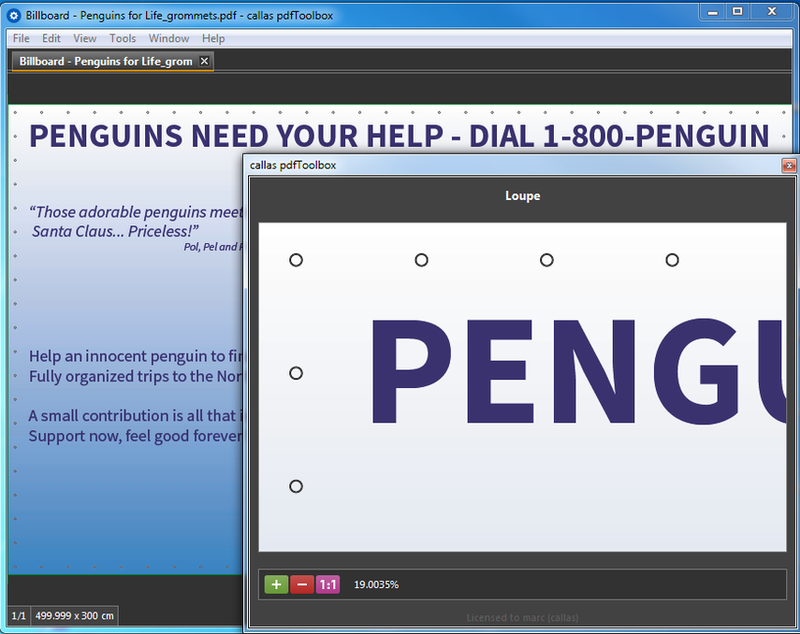 Added grommets will be available in both "grommet" Switchboard Actions. This Switchboard action is based on a Fixup using several Variables to define the placement. I figured out the settings that I need for adding grommets then the borders . Are you able to export these as actions to add them to a KFPX profile? I am more used to using the step and repeat and overlay function and when you figure out what you need you can Create a New Switchboard Action but there is no option to do that. Am I missing something? Hi Brian, it is indeed currently not possible to create an Action to be used in a Process Plan from the "Grommets"-Switchboard. It is, however, possible to do that based on the "Place Content" feature. I will double check with Product Management, but I think we should be able to provide you with a sample Fixup that you may adjust. We will contact you directly soon. Nice feature, but how do I set own symbols for the grommets instead of the big built-in grommets? Thanks for any hints! It is of course possible to add own grommets - I have just updated this article and added the way how to add own grommets.